There has been a resurgence in UK gas market price volatility this month caused by unseasonably cold weather and a number of supply disruptions. 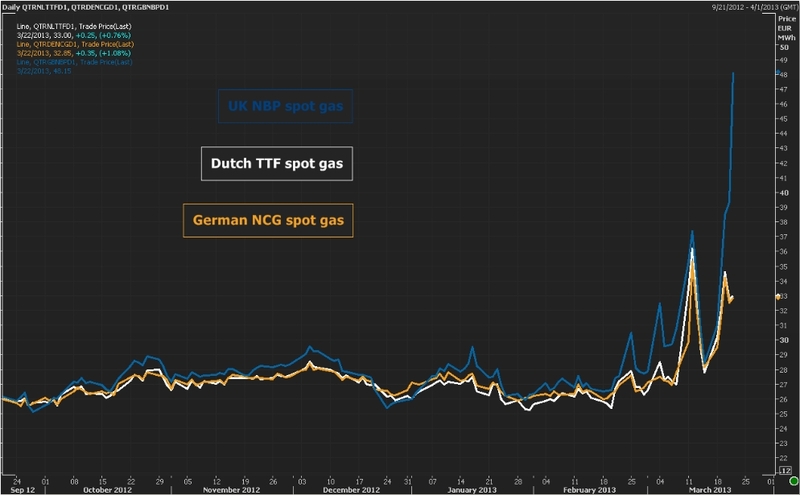 Prompt NBP hub prices have moved sharply higher in response to delivery constraints into the UK gas market. But short term delivery constraints should not be confused with long term security of supply. This is a very different supply issue to the one facing the UK power market. There has been a resurgence in UK gas market price volatility this month caused by unseasonably cold weather and a number of supply disruptions. Prompt NBP hub prices have moved sharply higher in response to delivery constraints into the UK gas market. But short term delivery constraints are not to be confused with long term security of supply. This is a very different supply issue to the one facing the UK power market. Wholesale gas price volatility has a tendency to make politicians, system operators and energy suppliers nervous. But the causes and implications of price volatility are often misunderstood. Gas supply and demand is inherently unresponsive to price in the short term given physical system constraints. This drives short term volatility in hub prices, during periods of temporary system tightness. These price movements provide the signalling mechanism which drives the physical flows across gas portfolios that are required to balance the system. These are an unusual but not extraordinary set of circumstances. Similar temporary bouts of short term price volatility have occured previously (notably in 2005-06) and the UK gas market has responded well. The dynamics of this response have changed over time, with a decline in UK North Sea gas production meaning the UK is more dependent on attracting imported supply. But UK import capacity has also increased substantially in response to production decline, particularly connection with a large network of Norwegian gas fields and the Dutch gas market. Beyond a horizon of two weeks (shipping lead time), the UK also has the ability to tap into very large volumes of LNG imports. Temporary periods of volatility are indicative of system tightness. They are not however a symptom of structural market failure. Rather this volatility sends an important signal to investors to provide additional short term deliverability. It also provides an important signal of the value of demand side response. Ultimately the system operator should be in a position to respond with a range of commercially negotiated options to temporarily curtail demand in response to more severe supply disruptions. The recent hub price volatility and comments of retiring Ofgem CEO Alistair Buchanan may have sparked national headlines on gas security of supply, but these concerns need to be considered in a level headed fashion. The current conditions in the UK gas market have very little to do with a long term gas supply shortage. The prevailing environment of forward hub prices trading below oil-indexed contract prices is reflective of the ample availability of gas supply into the UK and Europe. Most suppliers have the ability to increase annual flows under long term contracts if required. There are also substantial volumes of un-contracted Russian production that can flow into the European market if contract flexibility is exhausted. The current UK supply issue is one of short term deliverability constraints: field outages, interconnector failures and low storage balances. This does not reflect a shortage of gas, but a shortage of options to deliver available gas into the UK market. Alistair Buchanan’s comments on UK power market security of supply are a lot closer to the mark. The power market is facing a genuine security of supply crisis in the form of a major generation capacity deficit from 2015-16. This capacity issue has been compounded by government policy uncertainty and a range of inconsistent intervention measures to support low carbon generation. The problem facing the power market is very different from the temporary deliverability constraints that impact the gas market from time to time. But the UK government is openly discussing intervening in the gas market to support new sources of supply. The most likely form of government intervention is customer or taxpayer subsidisation of seasonal gas storage development, e.g. via the government imposing a storage volume mandate on suppliers. Addressing a short term deliverability problem by supporting development of seasonal storage capacity is likely to be an expensive mistake. This is reflected by the lack of investor enthusiasm in seasonal storage capacity in a market where winter/summer price spreads indicate a significant oversupply of seasonal flexibility (gas storage capacity is only one of a number of sources of seasonal flexibility). It is also wrong to assume that government intervention to reduce volatility will bring down customer gas bills. Short term price spikes have a relatively small impact on customer bills. On the other hand, government intervention to support non-commercial supply assets would be likely to result in a much bigger customer burden, both via pass through of direct costs and by driving up investment risk premiums. Current hub volatility is sending a healthy signal to private investors to develop incremental deliverability options, e.g. by adding pipeline compression, additional interconnector capacity or fast cycle storage deliverability. Government intervention to quash short term price volatility risks undermining the very investment in deliverability that is required. There are some clear lessons to be learnt from the policy mistakes of the Electricity Market Reforms (EMR) and the damage this has done to power market investor confidence. The UK is held up as the leading example of successful gas market liberalisation around the world. That reputation will be unlikely to survive heavy handed government intervention.